GIbbs is a rare greyhound puppy that is available for adoption! Gibbs won't be one until May. His sire is Djay's Octane and his dam is T Dazzle who is also the mom of Set Force that we have available for adoption. We have known Gibbs since he was a tiny puppy on his dog farm in Jacksonville. He was special and had some mobility problems and weakness in his rear end from the time he was very tiny. His owners aren't sure if he was stepped on by his mother when he was very tiny or if he was born that way. It has been obvious since he was very small that he would never race though. Although we could have easily adopted him out when he was tiny, his owners and our group decided it was best for Gibbs to stay on the farm. He had access to a huge area to run in, a lake to swim in and his littermates to play with on the farm. We felt his best chance to grow up strong was to be raised there with all that exercise to develop his muscles. It worked! Gibbs is strong and healthy now. Much better than he was as a small puppy. He still has an odd stride and isn't as fast as the other pups but he plays hard and has fun. 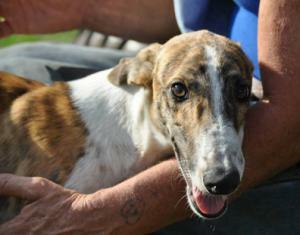 His litter just headed off to race training so now Gibbs is ready to get on with his life and find a family to love him. Because he was special, Gibbs got extra attention from everyone on the farm and had lots of visitors. He is very loving and sweet and has been handled a lot since he was tiny. We have photos of him from the time he was born that our volunteers and his owners took at the farm. Gibbs is a very special greyhound that needs a very special home. Because he is still a puppy he will need a fenced yard that he can play in and won't be suitable for apartment living. Gibbs has been running freely on a farm and hasn't been on leash until we picked him up so will need some training on how to walk on leash. He is a natural sitter and will sit right down and stop if you pull on the leash. Something all puppies have to learn. He does travel really well and was the best behaved dog on our trip up from Florida. He just curled up and went to sleep. He is a very loving puppy that is so sweet. Be sure to look at Gibb's other pictures to see his adorable tiny puppy photos!